**Community Outreach Matinees on 6/14 & 6/20: Backstage tours and a special craft activity for kids beginning at 12:45pm. There will be a talk-back session with cast and crew immediately following the performance. VLOC encourages our patrons to introduce new audiences to the performing arts at young age. This production of Ruddigore is appropriate for audience members of all ages. 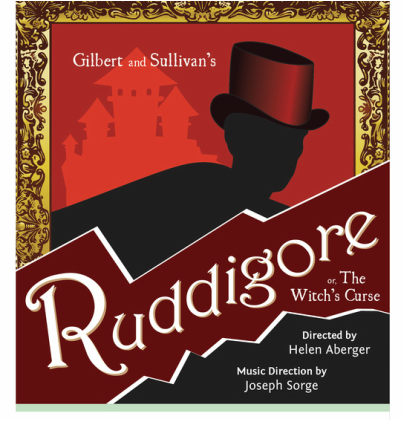 Ruddigore is supported in part by funding from the Montgomery County government and the Arts and Humanities Council of Montgomery County. Felicity Ann Brown, University of Maryland's Librarian for Theatre, Dance, and Performance Studies. Community Outreach Matinee - bring the whole family! Backstage tours and a special craft activity for kids beginning at 12:45pm. There will also be a talk-back session with cast and crew immediately following the performance. Overshadowed in its time by the success of Gilbert & Sullivan's previous work The Mikado, Ruddigore was and is not often produced. On its face, it's a rather bizarre story about ridiculous characters with whom it is difficult to sympathize. Without context, modern day audiences can be left feeling like they've missed a greater point. At its inception, however, Ruddigore was conceived as a parody of British melodrama- a popular theater genre in the 1880s. Melodrama features stock characters and plots- for example, a noble and heroic tenor loves the beautiful and chaste maiden but is thwarted by a villainous baritone. Gilbert and Sullivan turned this on its head and produced a story about a flighty soprano who is loved afar by a cursed comic baritone in disguise and is temporarily swept away by a roguish tenor sailor. Audiences in 1887 would've been familiar with the stock melodrama characters and been amused by the lampooning. But not all the twists are turns- Gilbert's characters defy complete categorization as good or bad, wrong or right- they actually live in a grey area of real, human qualities. And this is what we present day audiences can hang our hats on- who hasn't put on airs to be someone they are not? Who hasn't listened to their hearts dictates under the premise of doing right but ultimately served themselves? Who hasn't bowed to societal pressures? Through parody, reality peeks out to reveal how "topsy-turvy" life can be. I am delighted to present you with a traditional treatment of the operetta Ruddigore with a corps of fantastic artists, all of them here for their love of the art form. Gilbert & Sullivan are their own animal in the opera world – loved fiercely by their fans and looked sometimes skeptically upon by opera seria buffs – but their works have endured. I invite you to enjoy this seldom performed work and hope you come back for more! An early Baronet of Ruddigore had a witch burned at the stake, and she cursed him and all his line dooming them to commit at least one crime a day, under penalty of dying in unspeakable agony. Dame Hannah narrates this legend to the Chorus of Professional Bridesmaids, gathered around the cottage of Rose Maybud, an attractive young damsel who has not yet found a husband. Robin Oakapple, a young farmer, is in love with Rose but is too bashful to declare his passion. We now learn through Adam, an old retainer, that Robin is really Sir Ruthven (pronounced "Riven") Murgatroyd, the true Baronet of Ruddigore, who has fled from the Curse, leaving it, with the title and estates, to his younger brother, Despard. His foster-brother, Richard Dauntless, who has just returned from the sea, also knows Robin's true identity. Learning of the deadlock in Robin's love affair, Richard volunteers to see the lady and clear up the situation. On meeting Rose, however, he too falls in love with her, and, as his guiding principle is to obey "the dictates of his heart", avows his love to her, and is accepted. But when Rose learns of Robin's love for her, she promptly transfers her affections to him, remarking that while Richard is a penniless sailor, Robin is a prosperous farmer. Mad Margaret enters, and we learn that she had been in love with the present bad baronet, Despard. In a song, Despard reveals the depths of his infamy, but notes that he makes a point of atoning for every bad action by following it with a good one. Richard, still obeying the "dictates of his heart,” reveals to him that his brother, Sir Ruthven, is alive, and is in this very village, masquerading as Robin Oakapple. Robin now enters with his promised bride and the Chorus of Bridesmaids to celebrate the nuptials. But the wedding is rudely interrupted by the revelation that Robin is really the Bad Baronet. Rose promptly offers herself to Despard, who declares that he being no longer the Bad Baronet but a virtuous person, will be true to Mad Margaret. So Rose, not at all abashed, once more falls back on Richard, and a dance ends the first act. The second act takes place in the gloomy Picture Gallery of Ruddigore Castle, where the portraits of his ancestors look grimly down upon a sadly changed Robin. Richard and Rose dance in with their train of Bridesmaids to ask Robin's consent to their marriage. After some trouble, they obtain it, and depart. Robin then makes an impassioned appeal to his ancestors to relieve him of the 9 necessity of doing a daily crime. Stepping down from their frames, and led by his uncle Roderic, they accuse him of evading the terms of the Curse, and order him to do something really wicked--carry off a maiden that very day. When he refuses, they give him a sample of the "agonies" they have the power to inflict, and he is compelled to yield. The ancestors return to their frames and Robin orders Adam to go at once and bring him a maiden---any maiden! A reformed Despard and Margaret now appear, soberly attired, and describe themselves as District Visitors engaged in charitable activities. They have come to implore Robin to foreswear his wicked ways. He declares he will do so, when, upon their departure, Adam enters with the "maiden"' he was sent to abduct. She turns out to be none other than the mature Dame Hannah, who proves so well able to protect herself that Robin has to call upon his uncle Roderic for help. Roderic steps down from his frame, and we learn that he and Hannah were once lovers. Robin is summarily dismissed, and the reunited pair indulge in a sentimental duet. Their reunion is interrupted by the excited entrance of Robin---he has the solution of the whole business. Pointing out that, as a refusal to fulfil the terms of the Curse amounts to suicide, and as suicide is itself a crime, is follows that the Curse is inoperative! So Roderic finds that he must still be alive, Rose at once becomes the bride of a reformed Robin. Richard appropriates the chief bridesmaid and all ends in general rejoicing. Credit: Sullivan, Arthur, W. S. Gilbert, and Edmond W. Rickett. Ruddigore, or, The Witch’s Curse. New York: G. Schirmer, 1953.